Seatruck Progress is the first of four roll-on/roll-off (RoRo) ferries built by the German shipbuilder Flensburger Schiffbau-Gesellschaft (FSG). Image courtesy of Flensburger Schiffbau-Gesellschaft mbH & Co.
Seatruck Progress was delivered in December 2011. She operates on the Liverpool–Dublin route. Image courtesy of Flensburger Schiffbau-Gesellschaft mbH & Co.
Seatruck Progress berthed alongside her sister ship Seatruck Power. Image courtesy of Flensburger Schiffbau-Gesellschaft mbH & Co. Built in Germany, the vessel is designed and outfitted especially for the Irish Sea routes. Image courtesy of Flensburger Schiffbau-Gesellschaft mbH & Co.
Seatruck Power, the second ferry, was launched in October 2011 and put into operation in February 2012. Image courtesy of Flensburger Schiffbau-Gesellschaft mbH & Co. The third vessel, Seatruck Performance, was launched in January 2012. Image courtesy of Flensburger Schiffbau-Gesellschaft mbH & Co.
Seatruck Progress is the first of four roll-on/roll-off (RoRo) ferries built by the German shipbuilder Flensburger Schiffbau-Gesellschaft (FSG). Debuted in December 2011 on the Liverpool – Dublin route, this freight-only vessel is considered the largest and most efficient ferry to operate into and out of the English port of Heysham. The ferry is owned and operated by Seatruck Ferries, an Irish Sea freight ferry operator and a subsidiary of Clipper Group. Seatruck placed an order with FSG in March 2008 for the construction of four high-performance freight ferries. The contract called for the delivery of new builds between November 2011 and June 2012. It was part of Seatruck’s major fleet expansion programme. "This freight-only vessel is considered the largest and most efficient ferry to operate into and out of the English port of Heysham." The keel of the first ferry, Seatruck Progress, was laid in May 2011 at FSG’s Flensburg shipyard in Schleswig-Holstein, Germany. The ferry was launched and christened in August 2011. Construction was completed in November and delivery took place in December of the same year. The second ferry, named Seatruck Power, was launched in October 2011. She joined her sister ship on the Liverpool – Dublin route in February 2012. 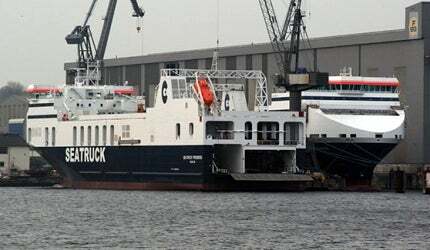 The penultimate ferry, Seatruck Performance, was launched and named in January 2012. Seatruck Precision is fourth and last in the series. She was launched in March 2012. Seatruck Progress is designed and outfitted especially for the Irish Sea routes. One of the most significant features of the ferry is that she is built as per the shipyard’s own stability standard known as ISEI (Insufficient Stability Event Index). This allows the vessel to adapt to the Irish Sea’s tough conditions in the most suitable way. MV Bore Song is the second of two roll-on/roll-off (RoRo) vessels built by German shipyard Flensburger Schiffbau-Gesellschaft for the Finnish shipping company Bore. While determining the ship’s dimensions, the designers had to take special care of fixed length and draught restrictions in the port of Heysham, and were simultaneously required to realise maximum cargo capacity. This requirement was met by studying the local conditions prevailing in the port prior to determining the ship’s length and draught. Seatruck Progress carries 20% more cargo volume on 10% less fuel, compared to other vessels of her size operating into and out of the Heysham Port. Another notable feature of the ferry is her speed to power performance ratio. It was achieved by restricting the ship’s weight by employing finite element analysis (FEA) and making targeted use of high-strength steels. The 3,830t dead weight ship measures 142m in length and 45m in breadth. Draught is 5.20m and gross tonnage is 18,920t. The RoRo ferry is built with four loading decks, giving a combined freight capacity of 2,166 lane metres. The vessel can also carry a maximum of 151 trailers. The height of loading bays on the main deck and upper deck is 5.3m, and 5m on the tank top. A bed of high-cube containers can be put on RoRo cassettes across the main deck. The ship can also be used to carry a variety of dangerous goods, especially on the uppermost deck. "The freight ferry is powered by two seven-cylinder 48/60CR main engines from MAN." All lanes are fitted with high-speed lighter aboard ship (LASH) systems and measure 3m in width. A stern ramp, measuring 17.6m in breadth, facilitates direct access to the main deck as well as the upper deck. Wider access to the main deck allows simultaneous loading and unloading. A 4.4m fixed ramp has been provided to get to the tank top from the main deck. The port side section of the stern ramp, together with a 6.5m fixed ramp, is used to access the upper deck. From here, the weather deck is accessed via a 4.4m wide ramp. The freight ferry is powered by two seven-cylinder 48/60CR main engines from MAN. Each of the two engines, designed to meet stringent emission and fuel consumption demands, can produce 8,000kW. In addition, there are two auxiliary diesel generator sets, two wave generators and an emergency diesel plant. Propulsion is attained by two four-bladed high-skew variable pitch propellers from MAN. Enhanced recoverability is achieved by two Wärtsilä CT200 bow thrusters, each 1,000kW, and high lift rudders.